Until recently, we have had significantly warm weather for this time of this year. The first Saturday of December, temperatures were in the 70s, which is unusual for Tulsa. Titus the Honorable and I decided to take advantage of the good weather and get in one more adventure before the cold took up a more permanent residence. This time, we decided to try something new and go on a little spelunking trip. 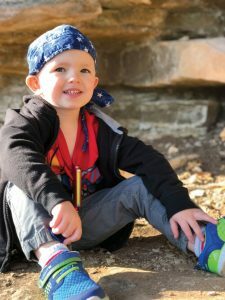 Since Titus is only 4, I knew we couldn’t explore real caves, but there is a rocky bluff outside of Tulsa that has some holes and indentation that looks like openings to caves, enough to satisfy a 4-year-old’s curiosity. He packed our backpacks, which consisted of some snacks, more snacks and yet still another baggie of snacks. Also included was a bottle of water, flashlight and his Mexican matraca. How do I explain to you what a matraca is? When the Spanish word matraca is translated into English, it means “rattle” or “noisemaker.” It is a wooden toy with a ratchet on top, and when you spin it around, a wooden board rakes against the cog, making an awful racket. I bought this delightful gift for Titus on my last trip to Mexico. I have made it my habit when I shop for my grandchildren to look for two things: 1) The size of the toy—the bigger the better and 2) the noise it can make—akin to No. 1, the louder the better. And if I can combine No. 1 and No. 2, I have made a grandparenting home run. Where did I learn this? From my parents, of course. You see, you haven’t lived until you have made an eight-hour drive home from Grandma’s house with two little children sitting in the back seat, banging away on their new drums or blowing on plastic piccolos. I gave Titus the matraca some time ago, but mysteriously, it ended up back at our house. When I told him we were going to go explore some caves, his eyes got big, and he asked, “Are there any bears?” I told him I didn’t know; we would have to go look. Titus knows a little bit about hiking in bear country. His Uncle Jeremy and Aunt Erin are avid hikers, and they use bear bells. These are bells attached around the ankles to warn the bears the hikers are coming so as not to surprise them. Titus in his wisdom thought that since we didn’t have bear bells, he would use his Mexican noisemaker. “Poppy, I can twirl my noisemaker and let the bears know we are coming, and it will scare them off.” So as we climbed up on the bluff, Titus got out his toy and began twirling it, making a racket. I walked, and he “WHHHAAACK, WHHHAAACK, WHHHAAACK, WHHHAAACK”ed. Even the dead could hear us coming. We spent the morning hiking, exploring, eating snacks and WHHHAAACK-ing. But do you know what? We didn’t see a single bear. I guess those things really work. Wouldn’t it be wonderful if we had a noisemaker we could twirl and all our problems, temptations and worries would be scared off? I wish I could tell you I have something like that, but I don’t. I can just about guess what would happen if Titus and I ever ran into a real bear. He would drop his toy and run as fast as he could to hide behind his Poppy. There, he would find a place that was safe, because he believes Poppy can fix anything. I just hope that, soon, he will transfer this trust to the real Father, who wants us to do the same. This Christmas, find your peace—run to God. I just want to take a moment to thank you for a wonderful year! You have blessed me through your cards, letters, gifts, phone calls and visits. You don’t send cards and letters or make phone calls to strangers; you do it because you are family. Each week, I try to let you know you are loved and are people of worth and value. On behalf of Titus the Honorable, Cohen the Goodhearted and myself, we want to wish you, our family, a very Merry Christmas. With or without a matraca, may the true peace of Christ be upon you and yours always.